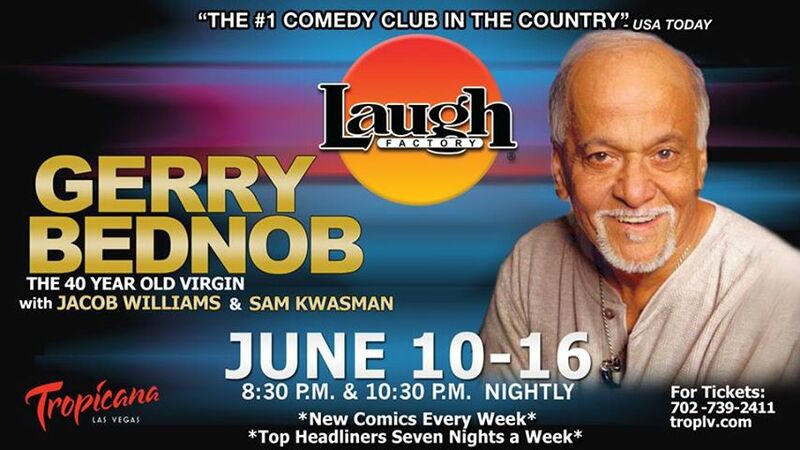 The week of June 10th-16th the world famous ‘Laugh Factory’ at the Tropicana Hotel and Casino, Las Vegas has a headliner that I can highly recommend Gerry Bednob. With two shows a night at 8:30 and 10:30– be there or be square! You can reach their box office at 702 739 2411 or troplv.com Las Vegas residents can get ‘Two for One’ tickets, and share the laughter with someone they know! 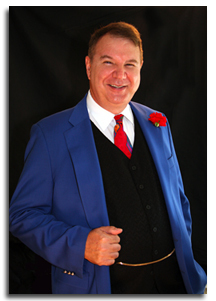 Once upon a time……..when I was l was living in the San Fernando Valley in Los Angeles, I joined a very exclusive and fun club—-regular performers at the LA Cabaret. If you didn’t want to drive over the hill to the ‘Comedy Store’ ‘Laugh Factory’ or ‘Improv.’ then you could zip over to Encino and be part of the line-up at the ‘Cabaret.’ It had a nice stage, good audiences and a fabulous bunch of regular performers. The shows were fun but hanging out in the greenroom was a blast all it’s own. The ‘Cabaret’ was booked by one of my favorite performers Jeff Wayne, a brilliant and edgy comic and somebody who a quarter of a century later has remained a really close personal friend– if you have never seen Jeff live then you must catch him next time he plays here in Sin City. One of my other favorite performers was Gerry Bednob who worked as ‘The Turban Cowboy,’ garnering many laughs from his Indian heritage. Gerry’s career received a giant boost in 2005 when he was featured in Judd Apatow’s breakout movie ‘The 40 Year Old Virgin.’ Gerry played an angry and irascible employee working side by side with Steve Carell and Paul Rudd in the Smart Tech store. When I first saw ’40 Year Old Virgin’ it took away back instantly to those happy times in the ‘LA Cabaret.’ One of the other regular’s at the club was a young stand- up comedian called Judd Apatow, who was honing his performing skills before his transition to becoming one of the most influential, successful and powerful writer/director/producers of this era. I thought Judd’s recent movie ‘This is 40’ was one of the smartest and most enjoyable cinema treats in the last few years– it made me laugh a lot and occasionally wince at how close to the bone it’s comedy cut. One of Apatow’s early television triumphs was his involvement as producer in Gary Shandling’s trailblazing HBO series ‘The Larry Sanders Show.’ You have seen this show I hope, if not run to Netflix and block out a few solid evenings! Other alumni from the ‘LA Cabaret’ (amongst other clubs) were the late great Robert Schimmel, Jenny Jones, Sam Kinison, Skip Stephenson, Hugh Fink and a host of others. The bills were varied and well planned by Jeff Wayne, and he wasn’t afraid to throw in a few variety comedy performers like myself. You had to be pretty darn funny to work with stand-up comedians such as were featured on a nightly basis. I think Jeff warmed to me the night when I was being heckled by a rather elderly and very drunken lady in the audience. Eventually I tired of her interruptions, I put on my most icy English manner and peering out into the audience and addressing her directly, invited her to; “Act your age–DIE.” Not very nice looking back, however it shut her up– and made a lifelong friend out of Mr. Wayne. 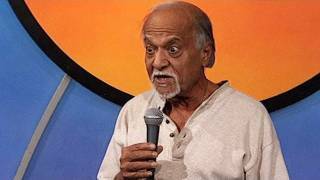 So, where was I before I started reminiscing about those carefree comedy club days,– that’s right, I was recommending you catch Gerry Bednob at the ‘Laugh Factory’ next week in Vegas. I will keep you updated on when you can catch Jeff ‘Big Daddy’ Wayne during his next Las Vegas booking. In these trying times what could be finer than to spend a couple of nights laughing yourself into a funnier and better place. ~ by Nick Lewin on June 6, 2013.